In the era of crowd-sourced recommendation services it’s hard to remember that people actually recommend stuff for a living. My old employer Village Voice Media, which built the foundation of its 20 online properties and 14 print publications like the SF Weekly and The Village Voice by mostly doing just that, has today taken these efforts mobile with its “Best Of …” app. With “Best Of ..,” VVM has taken its already existant “Happy Hours” and “City Guides” apps one step further, partnering up again with GoTime in order to create an recommendations app that utilizes the premium content produced for VVM’s yearly “Best Of” issue. 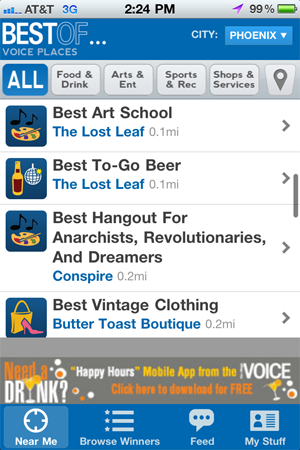 Just open the GPS-enabled app in order to get editorially-curated local recommendations in the Food and Drink, Arts & Entertainment, Sports and Recreation, and Shopping/Services categories. For those of you unaware, the Village Voice Media “Best Of” issues come out once a year and features staff writers and freelancers highlighting quirky things in each city, like “Best Marijuana Delivery Service,””Best Dog Friendly Gym,” or “Best Curly Haircut.” Like a Michelin Guide for things that are cool, “Best Of” is like having the knowledge of a bunch of really city-savvy friends at your disposal, and now at your finger tips. 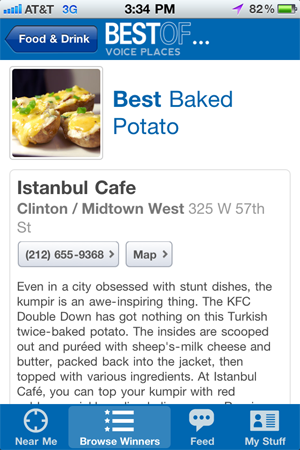 The “Best Of …” app allows you to browse all the “Best Of” winners by proximity and by category, as well as check in to places within the app and post your check-ins to both Facebook and Twitter (With an eventual plan for Foursquare integration in phase two). It also has features that let you plan what you want to do, send winner recommendations to friends through SMS or email, and vote for the winners for Reader’s Choice awards as well as share your votes on Facebook and Twitter. In addition you can view a feed of all app activity in your city and get badges for checking into winners like “Best Steak” in multiple cities. A “My Stuff” page lets you see the places you’ve checked into, the badges you’ve earned as well as city milestones, checkins, voting, etc. While Yelp and others are dominant in the recommendations space, what “Best Of …” has going for it is it’s expert (not crowd-sourced) curation. Is localized recommendation an ambitious goal for a a purveyor of Alt weeklies? “We’re not trying to be the next Foursquare. It’s for people who want to check into places and collect stuff, that’s it, ” says Jensen.